Is A ‘Special' Response Required From Roman? Is A ‘Special’ Response Required From Roman? I was probably one of very few Chelsea supporters who didn’t always buy into how ‘Special’ Jose Mourinho was. Ok, so maybe his first season at Chelsea found my backside rooted firmly to his bandwagon alongside everyone else’s – I bought into his ‘charming’ self-assurance, admired his ability to deflect press attention from his players and was in absolute awe of his man-management skills. Towards the end of his second season though, whilst I still rated him as a manager – and as far as the opposition were concerned I’d defend him with the last breath I had if necessary – the media circus surrounding him all the time, a limelight he seemed to revel in far too much, started to grate a bit. And if I’m honest, the embarrassing outburst over Ronaldo, dodgy results and the sort of football that pharmaceutical companies would love to bottle in the name of insomnia, left me feeling a lot less passionate about the love of Chelsea’s life. Naturally, when TSO and Chelsea parted company, I was as angry as the next man but I wasn’t necessarily surprised. The publicity surrounding Chelsea – or rather Jose Mourinho – was never going to be suffered indefinitely, and there were the rumours of dressing room unrest. Whether altogether true or not, there’s no smoke without fire and with someone as opinionated as Mourinho, it always felt a bit like touchpaper flirting with fireworks. So, I got over it a lot quicker than most. Convinced myself Roman was acting in Chelsea’s best interests, preserving the club’s image and protecting his investment if you like. 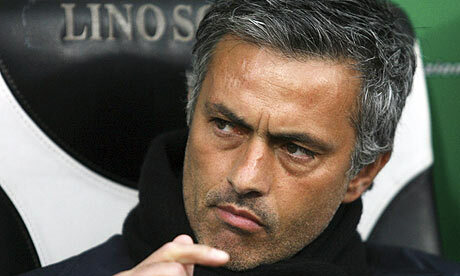 After all, without Roman Abramovich, our benefactor, there’d have been no Jose Mourinho at Chelsea in the first place. Of course, I didn’t approve of Mourinho’s replacement at the time but then replacing someone like TSO with Avram Grant was about as convincing as John Prescott imitating Brad Pitt in Fight Club – not happening. But he moved Grant on, so I stopped sulking and the whole ‘Jose Mourinho’ era just became a distant memory as we went from one manager to another. Obviously, every time Roman has swung his axe there’s been the predictable links back to Mourinho in the press but I’ve never given them attention and to be honest, I’ve never pined for, or even wanted a return to TSO’s days. Roman’s latest appointment seems to have sharpened the focus on that possibility more than ever though. Supporters are understandably disillusioned and angry and the press are surmising exactly how Mr Abramovich might go about turning the current mess around. The timing of last night’s ITV4 documentary brought TSO to the fore even more prominently and it was interesting to note Alex Ferguson’s response to whether Mourinho could succeed him at Old Trafford. What amuses me more though is the idea that Fergie plans to retire anytime soon – of course he doesn’t but as shrewd as ever, he certainly wouldn’t let anyone know that and risk Mourinho becoming direct opposition again. What he did do though was acknowledge exactly what sort of manager Jose Mourinho could end up being long-term, going so far as to admit even his own truly impressive record could be bettered by our former Portu-geezer. And it was that sort of accolade and something Mourinho said himself that made me realise you really don’t know what you’ve got until it’s gone. Because when asked why he thought we’d done so badly since he’d left Chelsea, Jose Mourinho said simply “because I left Chelsea”. He will probably go to Man Utd, the bigger club. I hope Carlo Ancelotti is brought back too. He is going to be moved from PSG soon it seems and we should try and get him back let him manage us without any interference (I know thats wishful thinking). We really played the best football under Ancelotti and I always remember that first season when we won home and away against all the big teams. We miss Carlo and Ray Wilkins. Its not a co-incidence that since they have gone, we have been struggling (barring RDM’s spell recently). Vladimir Putin will be a good manager at Chelsea.